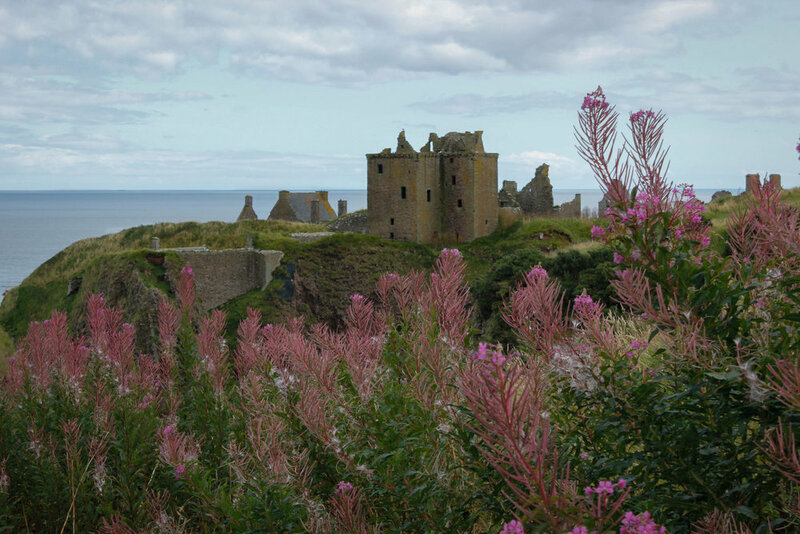 Amidst the ruins of Dunnottar Castle, hidden from the unsuspecting eye, are tiny ornately carved doors. 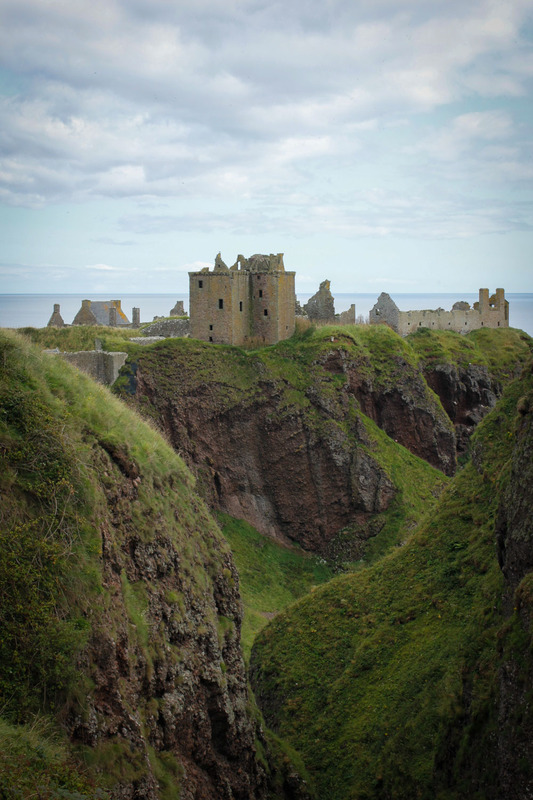 They belong to the aos sí, the little folk, who dwell in gilded halls beneath the towering cliffs. 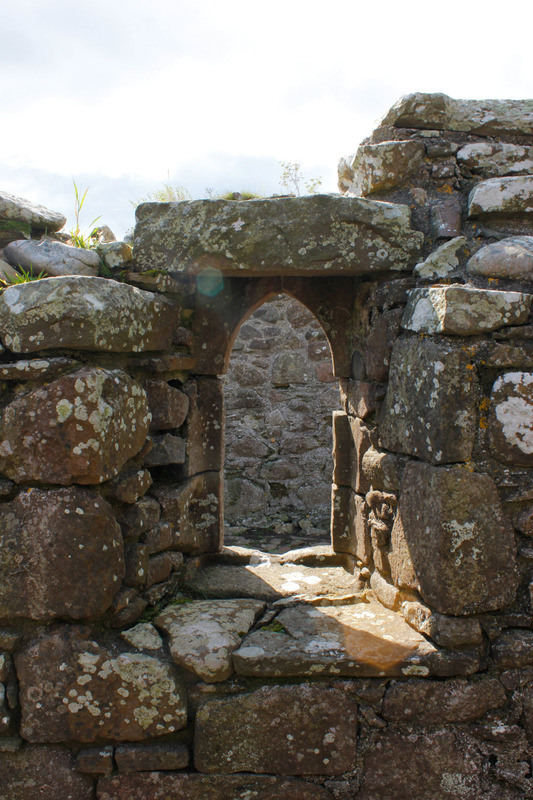 They were there long before the castle was built, before Saint Ninian built his chapel on that spot, even before the Picts who dwelt there thousands of years ago. The aos sí had claimed the place as their own when there were only rocky cliffs surrounded by an endless sea. Sometimes, on quiet days, they can still be seen playing among the ruins. It’s home to the fiery and curious Murrin. She often sits atop the remains of the highest tower watching the people below who come to see what’s left of the castle. She loves to listen to the old faerie bards and their tales of William Wallace and how he captured the castle from the English, of Viking raids and conquests, of the ghost of the "green lady" who wanders the ruins to this day in search of her lost children, the Picts, who had been converted when Saint Ninian came. And there is Iona, Murrin's twin sister. She's not as interested in humans and their stories as her sister. She prefers watching the seagulls dip and glide among the rocky cliffs and the seals at play below. Once, she saw a Selkie come up out of the waves during a raging storm, and take shelter in the little cave at the base of the cliff. Murrin & her chickadee stand 5" x 6". They are entirely hand stitched and felted from natural fibres. Murrin is dressed in a skirt made from various pieces of antique cotton and lace. Her jacket and cap are made from vintage Scottish wool. Her wings are hand painted vintage cotton. Her hair is mohair locks, hand dyed with onion skin. Her tiny features are hand embroidered from cotton thread. Iona & her blackbird stand 7" x 9". 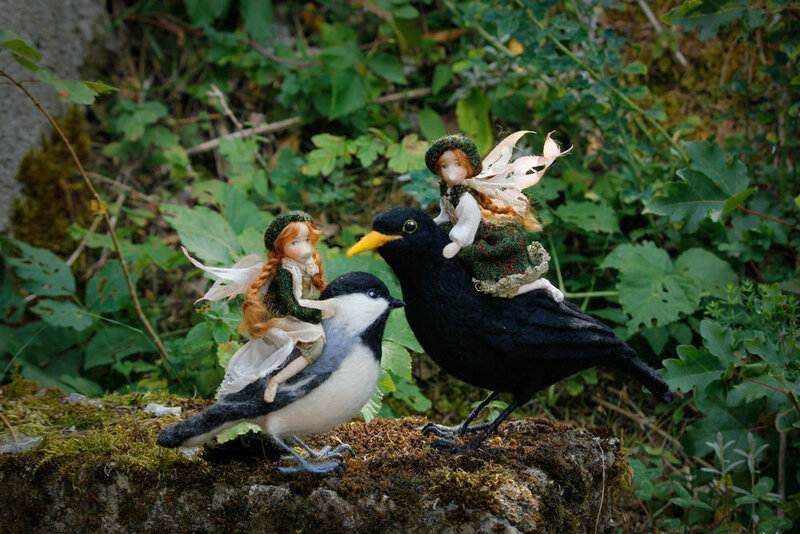 They are entirely hand stitched and felted from natural fibres. Iona's dress and cap are made from warm vintage Scottish wool. Her scarf is antique lace. Her wings are hand painted vintage cotton, and her hair is mohair locks, hand dyed with onion skin. Her tiny features are hand embroidered from cotton thread. **UPDATE** In an attempt to accommodate more time zones, I've moved the time ahead to 2PM, PDT. The price for Iona is $275 USD, plus $25 postage (worldwide). The Price for Murrin is $300 USD, plus $25 postage (worldwide).